"Morvarid Hotel, No. 24, Haft-e-Tir Square With Modares Highway and the metro station close by, Morvarid Hotel has an exceptional location where you can get to Tajrish square in less than half an hour. You can visit all around Tehran with ease when staying at Morvarid. Here you also have easy access to Karimkhan Street with its cafes and book stores, Valiasr Square, Museum of Jewelry, Museum of Carpets, Museum of Post, Yas shopping mall, and Bahar Street with lots of clothes stores. 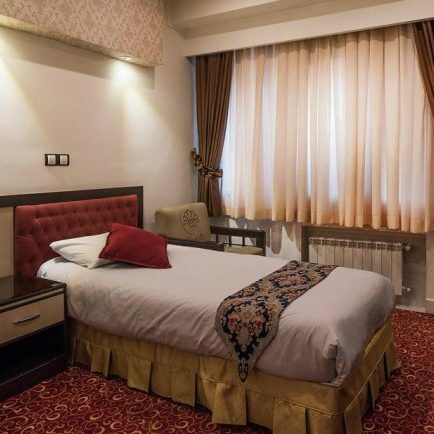 50 years of hospitality experience combined with modern services, Persian restaurant, fast food restaurant, and a traditional café, make Morvarid Hotel a great choice. "